In Navajo mythology, Born of Water, also known as Water Child, is one of the twin sons of Changing Woman born to rid the earth of the monsters who were killing the People. Born of Water is the younger twin, known as Tobadzîschíni in Diné. The twins are set a series of trials and, with the completion of each task, they get that much closer to achieving their final goal, which is gaining the tools and knowledge they need to save their People. After successfully completing many initial challenges, they are given weapons. The younger twin, Born of Water, is given prayer sticks and told to watch them as the older twin, Monster Slayer, goes out to fight the monsters. If the prayer sticks begin to burn, Born of Water will know that Monster Slayer is in danger and needs help. Monster Slayer goes alone to kill some of the monsters, and Born of Water accompanies him while killing others. 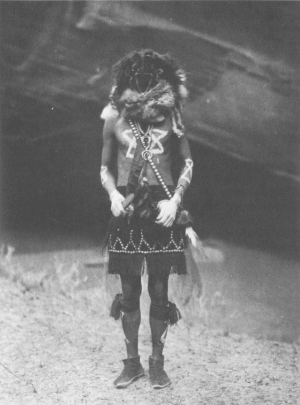 "Tobadzĭschĭnĭ, Born-from-Water, the second of the twin miracle-performing sons," photograph, Project Gutenberg Ebook of the North Amerian Indian (page 170) is licensed under Public Domain. 1938 Origin Legend of the Navaho Enemy Way. New Haven: Yale University Press. 1947 Starlore among the Navaho. Santa Fe: Museum of Navajo Ceremonial Art. 1994 Navajo Sacred Places. Bloomington: Indiana University Press. 1950 Navaho Religion: A Study of Symbolism. New York: Bollinger Foundation.